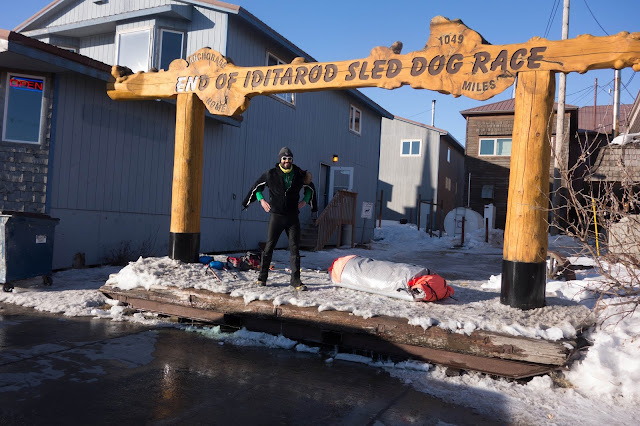 One week passed between my and Beat's arrivals in Nome, and I spent that time in a kind of limbo — not yet removed from the Iditarod Trail, and yet not out there anymore. 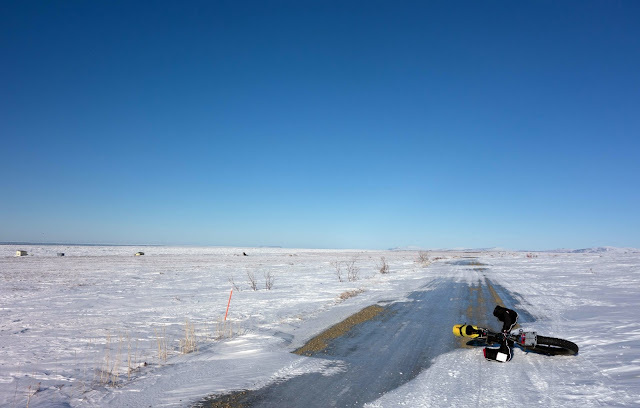 I had close to zero Internet access, only the possessions I carried from Anchorage and a separate set of clothing I'd mailed to Nome, and a somewhat worn-down body and bike for transportation. 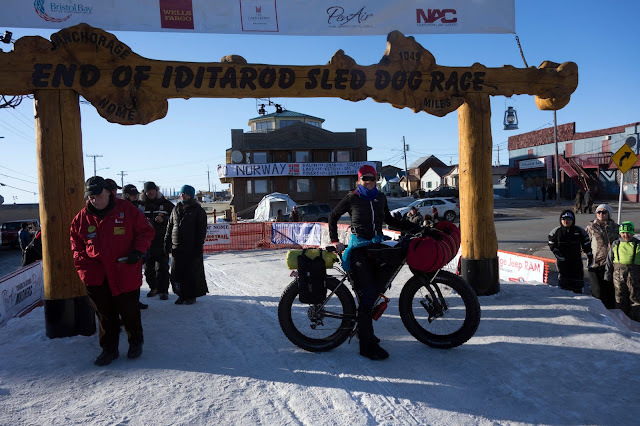 Through the winner of the bike race, Phil — an audiologist and hospital administrator who lives in Nome — I was able to connect with a physician named Roxy who invited me to stay at her apartment and then included me in a swirl of nights on the town — crab bake birthday party, dancing at Breakers Bar, salmon dinner, and the lavish Iditarod Sled Dog Race awards banquet that's as long and meandering as the trail itself. Although it may take some time, I have no doubt I'll eventually write down many words about my journey. The story of my last day on the trail deserves more than a summarizing paragraph, but much of it was marked by this exhilarating sort of frenzy to "race" musher Jason Mackey into town after he passed me on the last Topkok Hill and dropped his ski pole at the top, still 50 miles from Nome. That rather random and abrupt decision to chase Jason allowed me to slide in under the women's record (of which I wasn't aware) rather than take my time and draw out the final miles, which is what I'd intended to do before the -25 morning and a too-strenuous pace out of White Mountain left me drenched in sweat, shivering, a somewhat in a state of desperation — too chilled to stop but too shattered to continue — as I crawled over the seemingly endless Topkok Hills. (On the coast I'd become used to -10 and windy. Wind keeps you dry, but it was a calm morning, which results lot more sweat than I'd expected. 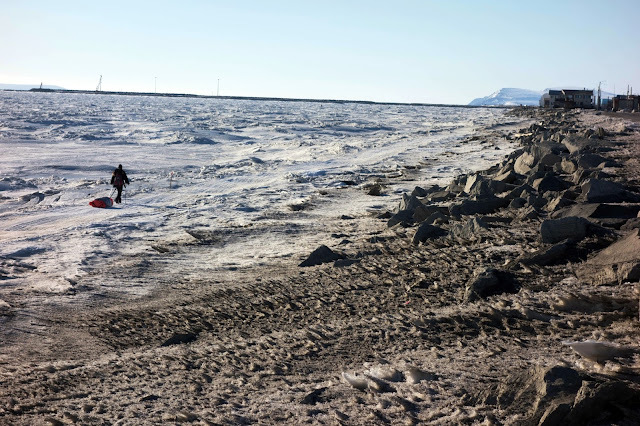 Sweat and respiration turns quickly to ice at -25F.) When Jason Mackey passed me I was on the verge of tears, and finding his ski pole and resolving to "catch" him was my final act of defiance — a defiance of every limit I set for myself from the start of that race to that moment on the hill. When I arrived at the finish line 15 minutes before Jason, I was overwhelmed by that small victory on its own. I could scarcely conceptualize the 900 miles that came before. 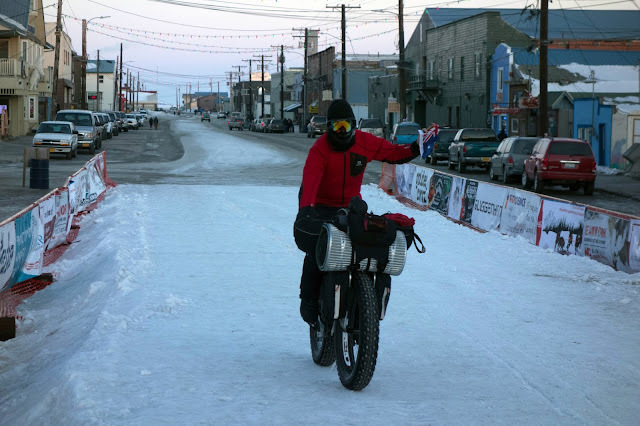 Because a popular musher was coming into town, the finishing ramp was crowded with dozens of spectators, and the barrage of interviews, conversations and questions left me bewildered and no doubt stammering as I wheeled my bike off the ramp and stumbled across Front Street. People asked me where my support team was, what had I arranged, where would I stay? "I have no idea what comes next." I wasn't thrilled with my finish line experience, and resolved to try to meet everyone else who came into town after me, so at least there would be one other person there who knew a little about what came before. To my great disappointment, I managed to miss Mike Beiergrohslein, who was my closest trail companion. Although we didn't often ride together, Mike and I kept a similar pace and spent most nights in the same places. We also shared the harrowing sea ice crossing, so I felt a special camaraderie with him. He arrived about four hours after me, by which time I was holed up at Phil's house eating leftover pizza and unsuccessfully trying to get Trackleaders to refresh. I finally did manage to get an updated location, but Mike had already been done for a half hour. This photo is the Australian, Troy Szczurkowski, who arrived the following evening. Troy finished with this stoic demeanor and appeared even more discombobulated than I felt the previous day. 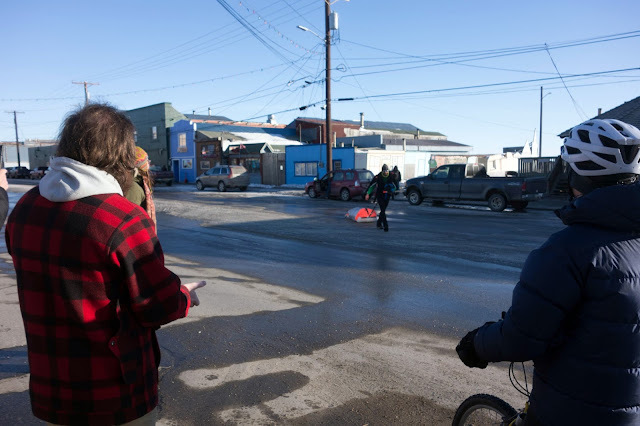 Martin Buser was there waiting for his puppy team to arrive, and Troy ignored the musher's good-natured ribbing to take off his balaclava so we could see his face. I introduced myself and offered to take Troy's photo, but he didn't really acknowledge me either as he returned to his bike and pulled out a lightweight tripod for his finish-line photo — even as at least a half dozen others offered to take it for him. It was all quite humorous — Troy seemed to completely block out the outside world and became a little huffy when we interjected on that illusion. I could empathize with this. You spend a lot of time alone on the trail. Another local physician, Nora, invited us both to have dinner with her. Her house was two miles away, and Troy pedaled so fast that I actually bonked badly as I raced him up the roadside trail. I was dizzy, lightheaded, and on the verge of fainting ... after 24 hours, I was well into recovery mode. It's so, so strange how you can simply tell yourself it's over, and everything shuts down. I'd experienced nothing like that in the 17 days prior. 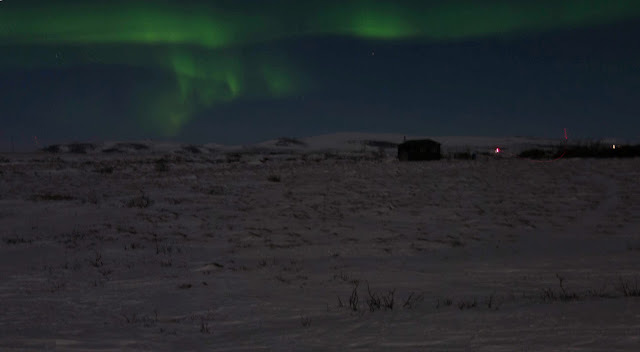 The following night, Tim Hewitt was on his way toward Nome. I convinced Roxy and a pediatrician, Eric, to drive out to the bridge over the Nome River and cheer for him as he hiked past. It was an intensely beautiful night, with silver moonlight over the jumbled sea ice and Northern Lights across the horizon. Sadly it was so windy that I couldn't take a decent photo — gusts rattled the camera even when I set up the self-timer and balanced it on the hood of the car. We cheered manically as Tim approached, and he probably thought we were a bunch of drunks. Eric called out "You Can Do It!" Roxy and I teased him because Tim had already covered all but three miles of a thousand — at that point, Tim undoubtedly knew he could do it. Tim hiked the trail in 19 days, 9 hours and change. It is an *incredible* achievement, made all the more so by the fact he's 61 years old. Having walked the 350 and now biked the 1,000, I feel like I have at least somewhat of a grasp on just how difficult it would be to hike the length of this trail in 30 days, let alone sub-20. I really don't think anyone will surpass this record anytime soon. 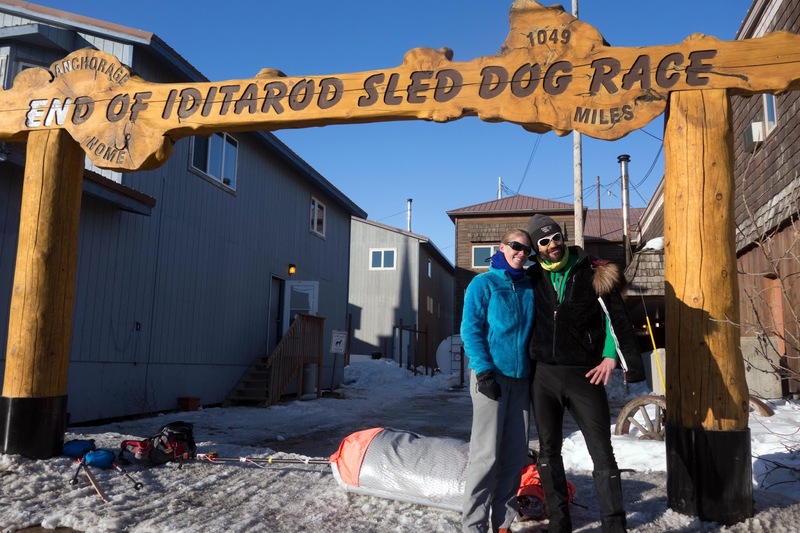 However, I continue to be surprised by the way impossible-seeming feats become possible on the Iditarod Trail. I apologize, but I couldn't help but post a horrifying photo of Tim's feet. It doesn't even show the worst blisters. He thinks this is normal. I'll state for the record that Beat prioritizes self-care and arrived in Nome with pristine baby feet. It doesn't have to be like this, but maybe it does if you want to break 20 days. We had a great time sharing stories of the trail with Phil, who battled a number of mechanicals and still came in under 12 days. The mushers' banquet happened on Sunday afternoon. I sadly also forgot my camera for this colorful affair, which included excellent people-watching as some 800 Nomeites, mushers, volunteers, super-fans and spectators crammed into a gymnasium whose fire code no doubt allowed for no more than 500. We ate chocolate-covered strawberries out of a decorative dog sled and listened to at least 70 speeches before the temperature in the room rose above 90 degrees and we had to escape. The banquet is fun but I think it would be beneficial for everyone if they figured out a way to streamline all the speeches. It's just too many speeches. Monday I decided it would be fun to get back on my bike. I'd been commuting around town with it, but felt well enough recovered to do a recreational sightseeing ride on the unmaintained roads beyond city limits. I'd planned to go out for 45 minutes before turning around, but as I spun toward the mountains beyond Beam Road, I slipped into that meditative flow that carried me along the Iditarod Trail on my best days, losing all track of time and distance. 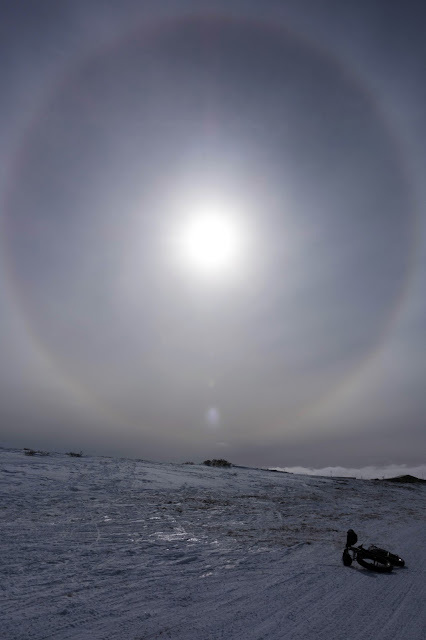 A thickening patch of glare ice snapped me out of my reverie, and by then 17 miles and two hours had passed. I briefly fretted that I was going to bonk before I got myself home — similar to my episode with Troy — but it was just as effortless on the return. Somewhere along the Iditarod Trail, away from the fretting and self-defined limits, I'd pedaled myself into pretty good shape. 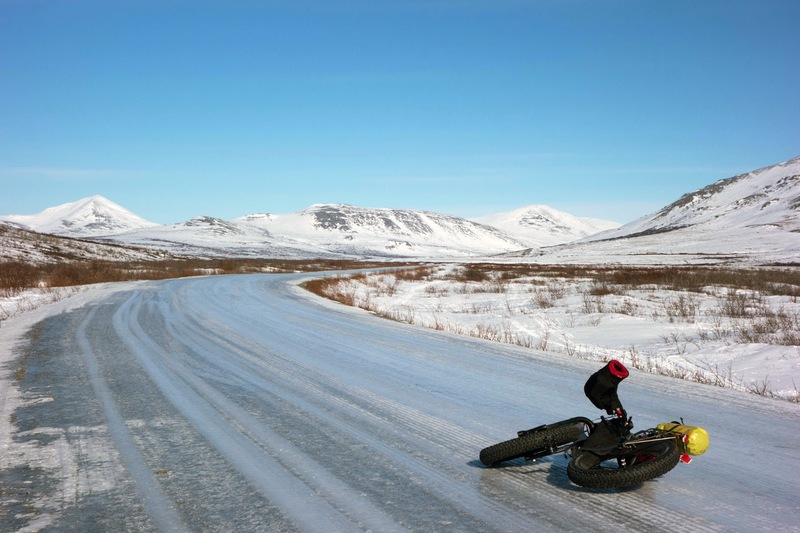 On Tuesday I rode 17 miles out the Nome-Teller Road on purpose, as that was the distance to the top of the first pass. 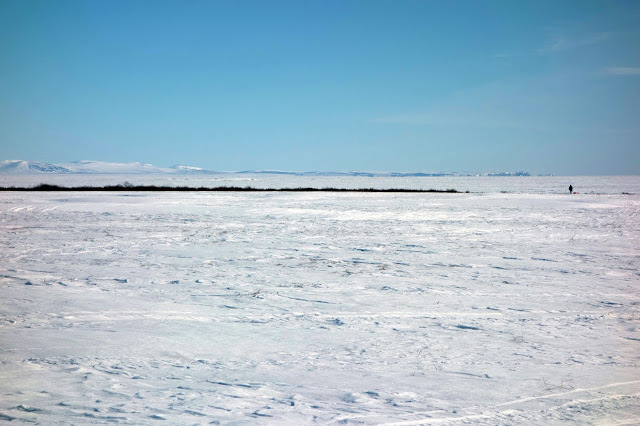 Phil had chided me for riding the roads because Nome roads are "boring," but I find nothing boring about views of the frozen Bering Sea and stark, white mountains. The conditions on the roads also are not boring. 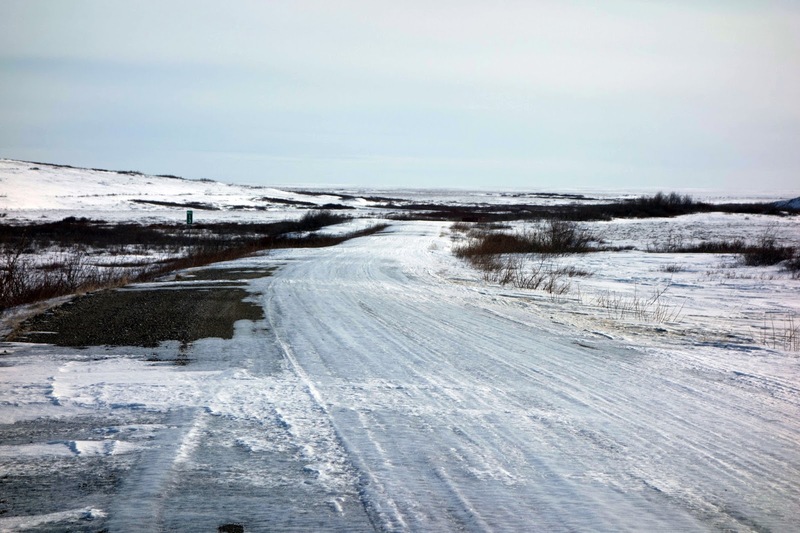 They start out as gravel, but quickly deteriorate into packed snow, glare ice, and hardened wind drifts. 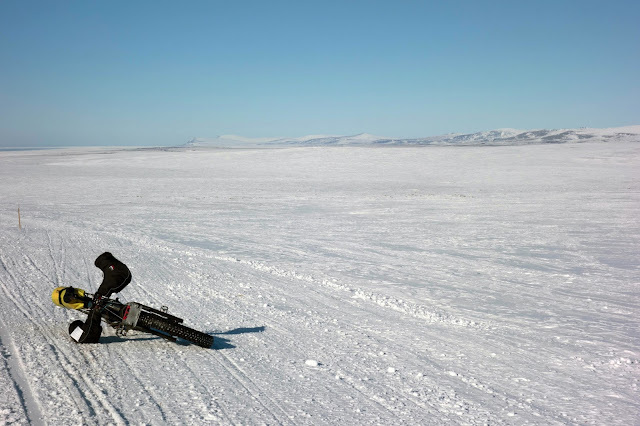 The "sastrugi" are especially fun to ride — similar to bumpy slickrock with the occasional patch of sand deep enough to swallow a wheel. On Wednesday, Beat was making his way into town. Although I felt great on Monday, the back-to-back four- and five-hour rides had taken their toll, and my legs were jelly again as I pedaled out of town with the hopes of seeing him near Safety. On this ride I went up and over Cape Nome, a scenic climb I'd skipped on my own ride into town because the road is regarded to be the faster route. I began to perk up as I mashed the pedals up the steep slope, mostly because I knew Beat's and my paths were close to intersecting. 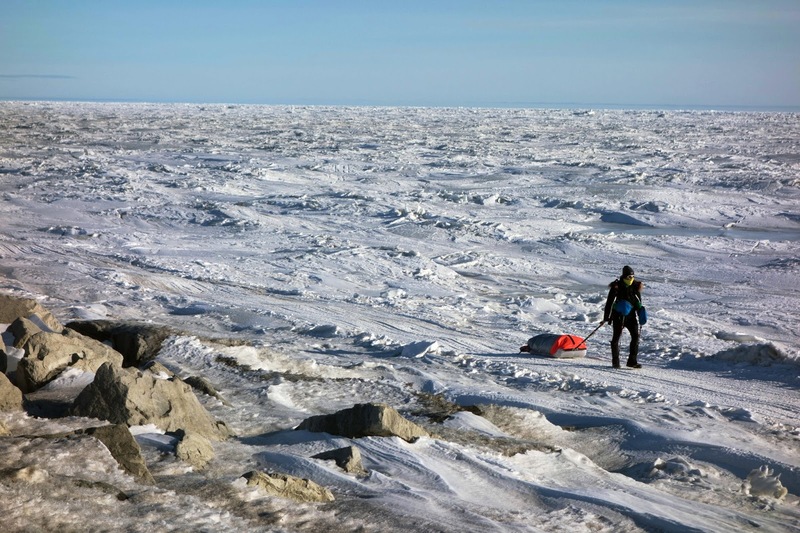 I caught sight of him three miles past the Cape, just under 16 miles from Nome. It was a more subdued meeting than I expected — it's a long 70 miles from White Mountain, and Beat had a rough night through the windy and cold corridor often referred to as the "blowhole." He needed to stay in his headspace just to keep himself moving forward, so we shared a kiss and then I veered off the trail toward the road, which ended up costing me an extra 3.5 miles and made for a third 34-mile ride. I admit to being sad that I had to leave Beat behind. 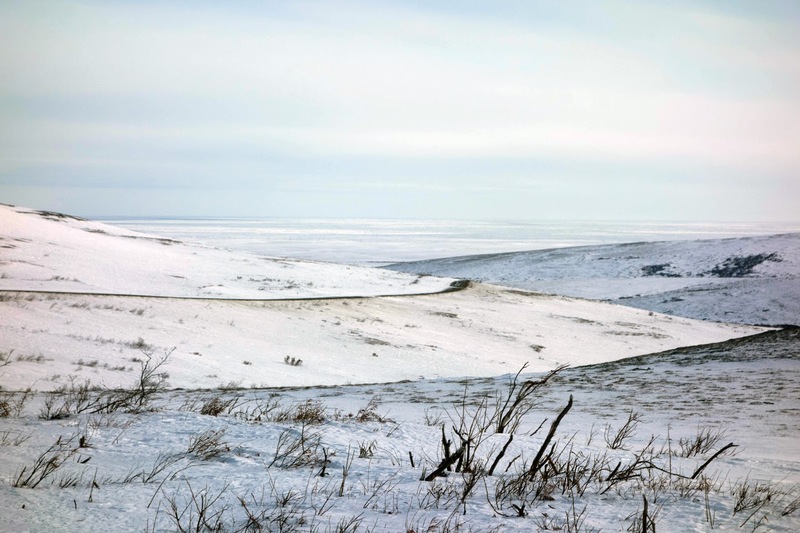 I'd harbored these daydreams about flying into White Mountain and walking with him along the final stretch to Nome. 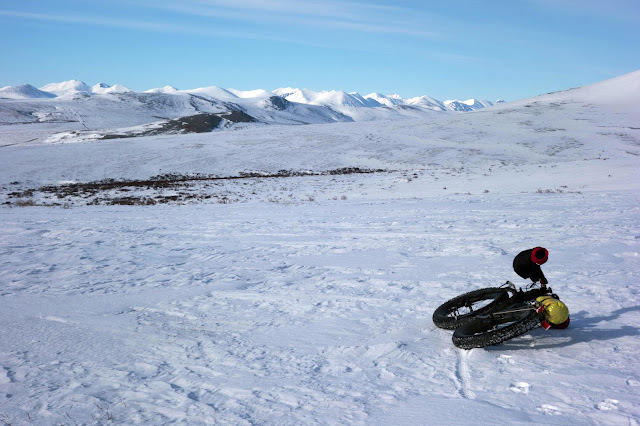 But race rules don't allow that, and I didn't have a sled or appropriate walking gear, nor any reason to believe that after three weeks with a fat bike, I would be in shape to hold Beat's pace for 70 miles. But perhaps, someday, we'll travel this trail together. 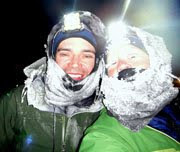 By the time I met up with Beat again, about a mile from the finish, the temperature had warmed up to 33 degrees and the trail was rapidly deteriorating. Beat was exhausted and the slush made it worse, so he wasn't in the best mood. Beat approaching town on the shoreline. I'd recruited a handful of friends I'd made during my week in town — most of them medical professionals — to cheer for Beat at the finish. 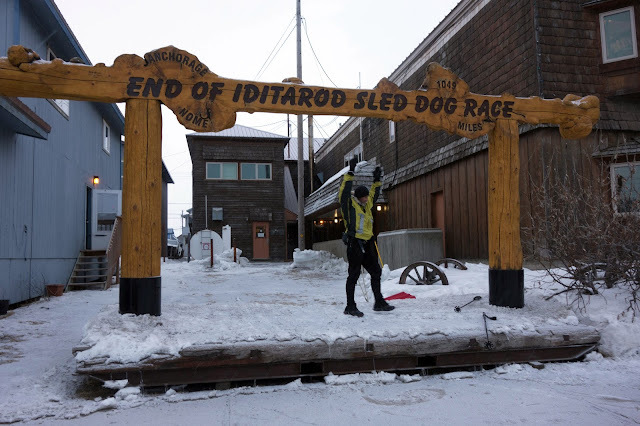 After the sled dog race ends, they move the burled arch to an empty lot across the street from the Nome Liquor Store. A quiet but triumphant finish. Beat and I, together again under the burled arch. I love this guy. Since the first day of my race, I grappled with numbness in my right hand. It became bad enough that I lost most of my dexterity and strength in my thumb, index, and middle fingers, and struggled to even zip up my coats (I'm right handed.) I can't make a fist without using my other hand to move my fingers, and I often wake up to throbbing pain during the night. 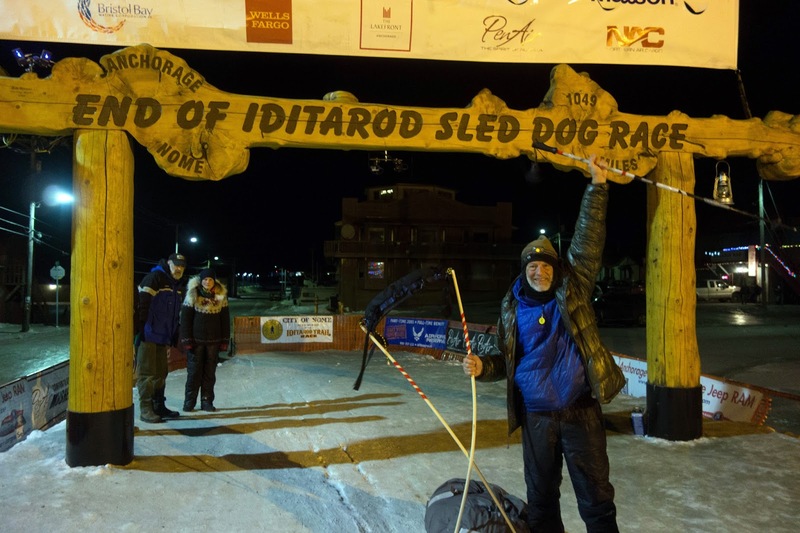 My hand was so useless that I knew even a minor mechanical such as a broken chain would probably end my race — unless I could find someone to help me fix it — so I was very lucky to get through the Iditarod without incident. My new Nome friends helped me diagnose this as a case of carpal tunnel syndrome, and a shock test performed by a physical therapist at the hospital revealed almost no response from my median nerve — it's effectively not firing at all. It could take a few weeks or even months to heal, or it may require surgery — which is to say I didn't exactly meet my top goal for this race, which was to come home healthy. I also shouldn't be riding my bike until my hand heals, which I used as an excuse to go for "one last ride" in Nome before I probably have to give up cycling for at least a few weeks. I know, I know. 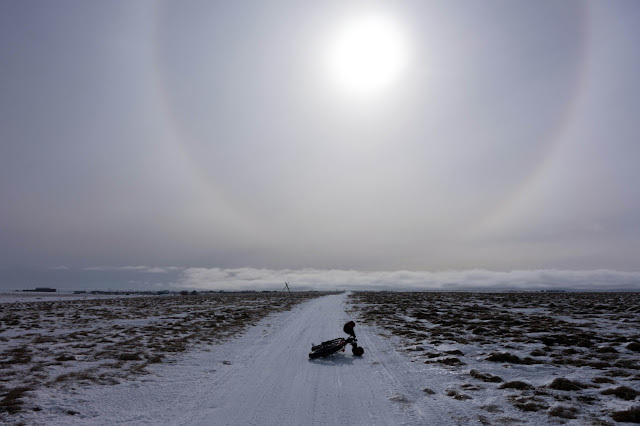 But it was an incredible final outing, riding into a sparkling sun halo. 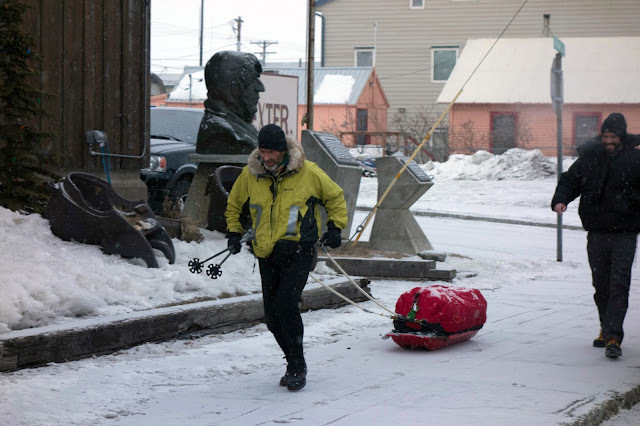 We flew out of Nome on Friday afternoon, but were able to watch Eric Johnson — yet another physician from Ogden, Utah — arrive amid a blustery snowstorm in the late morning. 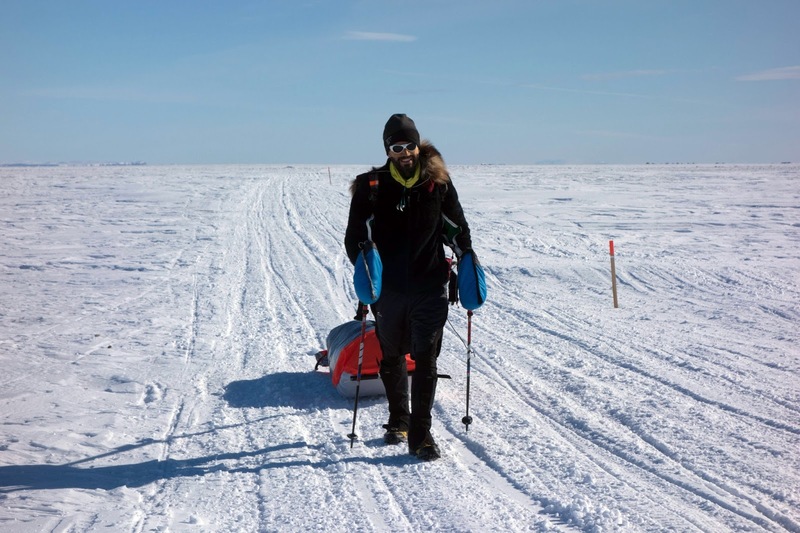 Beat traveled near Eric early on, but spent most of the race traveling alone as Eric fell nearly two days behind. Amid the low visibility, Eric wandered onto a side trail and walked two or three extra miles when he was only three miles from Nome, and had been out of food and water for a while. He too exhibited an interesting combination of frustration and elation under the arch. 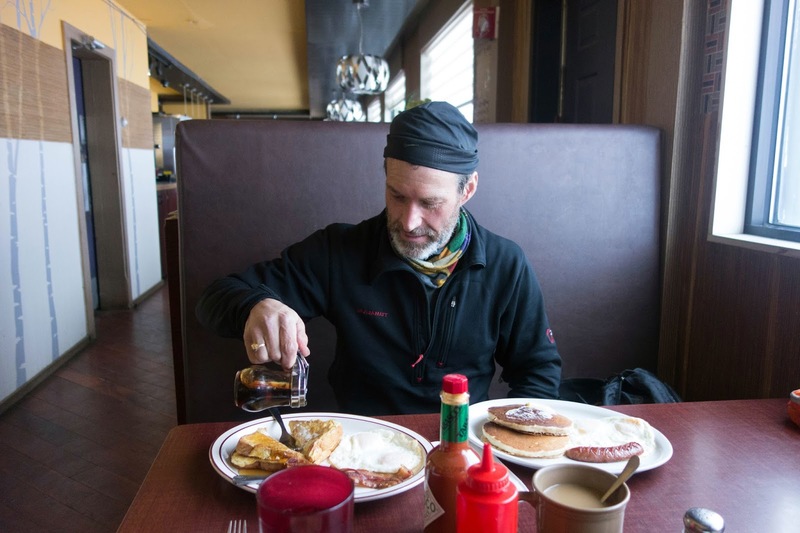 We took Eric across the street to the Bering Sea restaurant, where he ordered two breakfasts and consumed that entire jar of syrup. We all left on the 8:30 p.m. flight to Anchorage, where the cloud ceiling closed in before the plane even cleared the sharp point of Cape Nome. I felt a sharp tinge of sadness as Nome disappeared. Nine days is a long time to linger, but it felt like a blip in time. Thank you for sharing Jill!! Congratulations on a great ITI foryou, Beat, Tim and the other competitors! Tim's FEET . . . oh my goodness!! I had subscribed to "INSIDER" to track the mushers. It was interesting to look at both maps to try and figure out how many (if any) mushers were close to you. I could see the last few miles that you and Jason were "neck & neck"! Again, thank you for sharing your adventures and your honest thoughts! You have inspired me more than you can ever know. Linda D.
Wow...great wrap-up Jill! Can't even begin to imagine the feeling of that LONG journey ending. I'd guess it would be quite happy/sad, and you'd likely be 'lost' for a few days trying to figure out what your 'new' normal is...after having that dictated by the trail for SO long! Congrats to you both for an AMAZING adventure...and can't wait for more detailed write-ups from you both. Beautiful writeup--I so look forward to the full story. Congrats to you and Beat again! I know you hate leaving Alaska, but at least you are going to a new beautiful place in the Rockies! I would love to hear more about how you get back to being social after all that time alone. I have done some long distance events and always have a hard time making sense of it all and talking with people after their completion. I can't imagine that many days how I would feel! Also what a beautiful Sundog picture! We have had so many in Northern VT this winter not sure why I usually only see one! Congrats on your finish!! Wonderful in every way! You describe things so well, and I'm thrilled that you had an amazing adventure, all the way to Nome!!!!!!!! As for carpal tunnel, I've struggled with it too, mainly during fat bike season. I had to get cortisone injections into both wrists a few winters ago (but I had only numbness - and little weakness). The injections worked. Now, I have a soft Bluto fork, and I'm super careful about hand/wrist pressure. However, the symptoms always return (but to a lesser extent than that first episode) during fat bike season... I hope that yours heals fast. I didn't feel my left hand for six months after the ITI (350) in '02. I have since then switched bars, adjusted bar height, changed grips and changed my habits as to where and how I grip the bars. I hope that your hands feel better soon.